After a police chase along I-5, a suspected robber and carjacker was arrested by police on Sunday. He was driving a white Fiat 500, which police say was stolen from a woman in Queen Anne at gunpoint on Saturday evening. The carjacker then drove to West Seattle, where police believe he held another woman up and stole her purse, before heading south on Airport Way. The thief ended up losing control of his stolen car while being chased by police, and crashed into another vehicle. 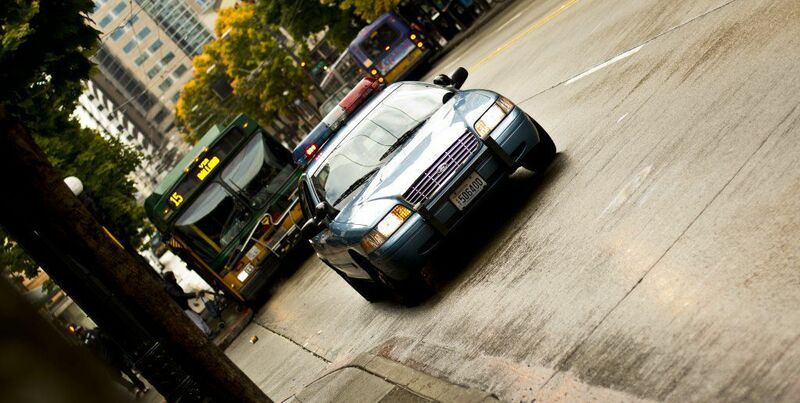 Police Chase Car Accidents: What can you do when you’re hit by a criminal? Most drivers should know the standard procedure after a car accident. But what are you supposed to do when the person who caused the accident leaves the scene in handcuffs? Criminals don’t stop to buy car insurance before stealing a car, but a crash with a driver who’s not legally supposed to be behind the wheel can leave you with severe injuries. You can protect yourself by making sure that your own policy has coverage for damages called by uninsured motorists. Be aware that if you do make a claim for UM benefits, your own insurance carrier as the right to use all the defenses that the at-fault driver would have used if you had sued them directly. This means that if your damages are high, you may end up in a legal battle with your own insurance carrier. You can only file a claim for UM benefits if you already have coverage against uninsured motorists—there’s no way to apply and try to claim the benefits after the crash has already occurred, so make sure you’re protected before an accident happens. You may also be eligible for some restitution by the Washington State Crime Victim Compensation Program. This program can cover some medical bills, loss of financial support and funeral expenses incurred as the result of violent crime. Unfortunately, the monthly budget of the compensation program is low, and if you have extensive damages, you may not be able to recover the full amount you need. The compensation program can’t cover damages to personal property, crime scene cleanup or expenses that other health or accident insurance will cover. If you do recover damages from your own insurance company or any insurance that the criminal has, you may have to pay back the Crime Victim Compensation Program. If you have been injured in an accident - even if that accident was the result of a crime - it’s a good idea to consult with an experienced personal injury attorney. Criminal cases are not the same as civil cases; even if the criminal is convicted for his crimes, you may not receive any restitution in criminal court. You may need to file a lawsuit in civil court, either against the criminal or your own insurance company, to recover damages. An attorney can help you figure out whether your injuries will be covered by your insurance without problems, or whether your claim needs to be litigated.